University of Sheffield 20-21 June, 2016. UAVAid co-hosted a special conference on Cargo Drones in Humanitarian Contexts. 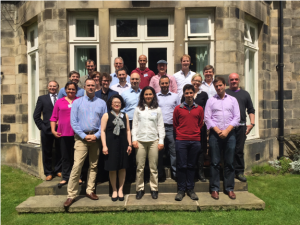 The event brought together leading experts, users and regulators from across the world to discuss issues relating to the use of delivery drones in humanitarian applications. The event was co-hosted by UAVAid, University of Sheffield, UAViators and DG ECHO. UAVAid’s involvement as co-host was through the LCmRG (Last 100mile Research Group), with group members Professor Joseph Lampel, Professor Ian Shellard and Trudi Hilton in attendance, as well as host Daniel Ronen. Participants included representatives from: AerOptim, Airbus Helicopters, DG ECHO, Emergency Telecommunications Cluster WFP, FSD, Handicap International, Imperial College London, International Federation of Air Traffic Controllers’ Association, Map Action, Medair, MSF, PRIO, Quantum Systems, Redline, TH Pharmacy, UAVAid, University of Manchester, University of Sheffield, WeRobotics, WFP, World Bank. See the Advanced Resource Efficiency Centre at University of Sheffield news blog, >click here<.